University of Manitoba architecture students Brooks Keen, Braden Funk, and Kevin Neufeld are leaving their mark all over Winnipeg during the final year of their degrees, and highlighting local businesses and icons in the process. Their new project, the OrangeBench , aims to draw attention to Winnipeg staples by travelling to a new location each week, the idea being that patrons of the businesses will take photos with the bench and share the photos on social media using the OrangeBench hashtag to create a connection between the Winnipeg community and the local icons. The project began as a complementary piece to the faculty of architecture’s design contest inviting professional designers across the world to create warming huts for the Red River Mutual Trail over winter , but eventually evolved into an extension of the trio’s interest in exploring what makes Winnipeg unique. “Initially we wanted the OrangeBench to kind of take a journey around Winnipeg and create hype for the warming huts. Then it would make a stop at the warming hut we designed,” said Neufeld. “After the design contest […] we decided to continue with OrangeBench,” added Keen. To start out the project, Keen, Funk, and Neufeld needed to decide what about Winnipeg is noteworthy . “We asked a lot of people what they think makes Winnipeg what it is – which businesses, which places, which moments – to start out the project,” said Neufeld. Answers ranged from riding bikes in the dark during Nuit Blanche to wandering around the Forks, giving these non-native Winnipeggers some room to play with when deciding the bench’s next stop. “The business the bench stop is at has to be local, so it can’t be some chain business – it needs to be unique to Winnipeg, something that only Winnipeg offers,” said Funk. “We’ve also started looking into how they contribute back to the community because we think that is a crucial staple to a local business: what is it doing for Winnipeg?” said Neufeld. Keen added that collaboration between small businesses is a big part of Winnipeg’s communities. “We really like when local businesses work together to grow and establish themselves. But that being said, our intention is not only to promote businesses, it’s also cultural spaces in Winnipeg,” he said. Although the three creators only recently moved to Winnipeg for school, they have already developed an affectionate relationship with the city and its idiosyncrasies – and thanks to the bench, the relationship is continuing to blossom. “Every place the bench goes, we physically go and talk to them and experience what they have to offer. We always want to go experience it so we know exactly what that business has to offer and what the bench is highlighting,” said Funk. “It’s also helping us get to know Winnipeg. I didn’t know about half of these spots before the project. Even if it’s not helping anyone else, it’s helping us,” he added. The trio, while jokingly blaming their degrees for keeping them locked up in the studio, credits much of their success to their backgrounds in architecture. “I think our background in design really influenced the project. That’s a big aspect of the project – how design can start helping the local community,” said Funk. According to Keen, the project has steadily been gaining traction through Instagram and word of mouth, which has been a pleasant surprise. “I think other people are seeing it more than we are, actually. We have no idea how big it has gotten,” said Keen. 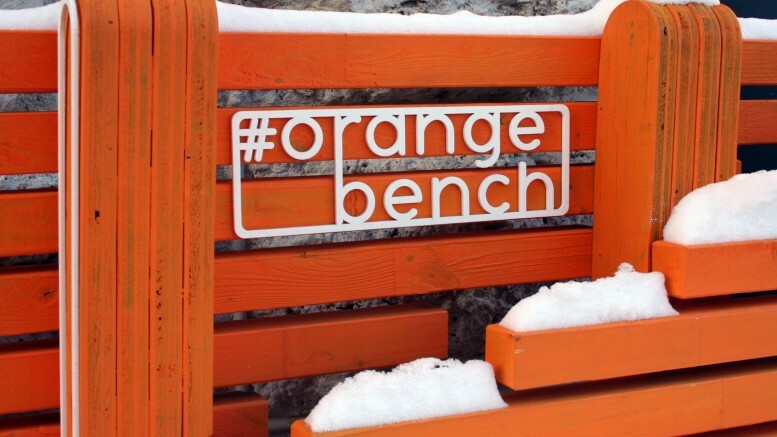 Follow @orangebench on Instagram to learn more about this growing social media project, and search #orangebench to see all the photos shared thus far.